Nellie Bly wouldn’t take “no” for an answer. That trait was one key to her success in 19th-century journalism, writer Rosemary J. Brown says. Ms. Bly’s persistence got her a first job at the Pittsburgh Dispatch in 1885, when she was 20 years old. Within two years she had talked her way into an investigative reporter’s position on the New York World. When a skeptical editor at the World at first declined to send Ms. Bly on an around-the-globe journey in 1889, she threatened to take her talents to a competing newspaper. “He had told her she’d need several trunks and a chaperone to make such a trip,” Ms. Brown said. Faced with the threat of seeing her byline appear in a rival publication, the editor relented. Getting just two days’ notice, Ms. Bly left New York for London Nov. 14. 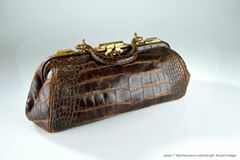 Her only luggage was a 16-by-7-inch Gladstone bag. 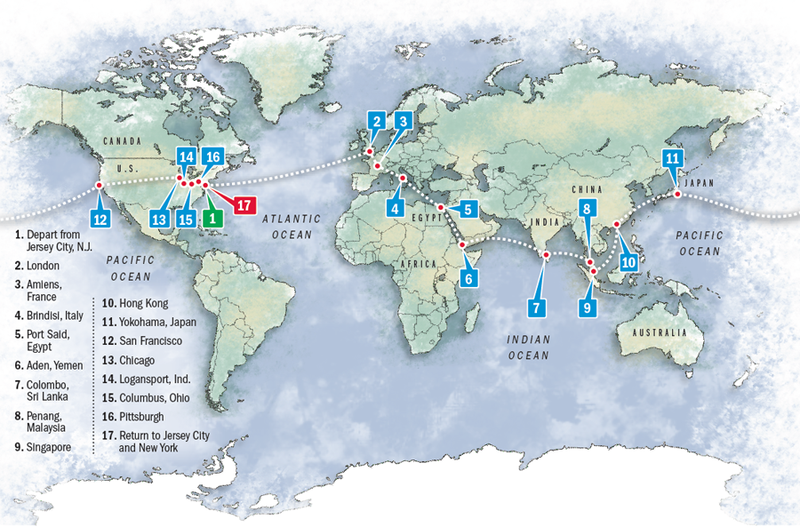 Ms. Brown, who lives in London, retraced large portions of Nellie Bly’s famous around-the-world journey, which ended with her triumphant return to New York City 125 years ago today. The idea behind Nellie Bly’s journey was to beat the record set by the fictional Phileas Fogg in Jules Verne’s “Around the World in 80 Days.” When she successfully completed her trip, she became a national celebrity. Commercial vessels travel according to variable schedules, depending on the cargoes they carry. “Going that way might have taken several years,” she joked. Ms. Brown instead purchased an airline ticket for 2,132 British pounds, or about $3,200. “While the vast majority of my travel was by air, I used lots of public transport — trams, boats, ferries, buses and trains — getting to the places she had been,” Ms. Brown said. A donation was made to Rainforest Foundation UK to offset carbon. Aware that her multiple flights to six countries were creating a large carbon footprint, she made an offsetting donation to the Rainforest Foundation UK. The international nonprofit organization works with local people to preserve rainforests, which absorb large amounts of carbon dioxide. She also used her trip to call attention to the plight of Syrian refugees, raising 1,000 pounds, or about $1,500, for their relief through UNICEF. While much of the world has changed dramatically since Ms. Bly completed her trek, Ms. Brown found two places where she could be certain she was standing exactly where her role model had once visited. One location came early in her journey when she toured the salon and study in Jules Verne’s house in Amiens, France, 75 miles north of Paris. Ms. Bly had visited Mr. Verne at his home. “After that stop, I thought [Bly] was kind of with me the whole way,” Ms. Brown said. 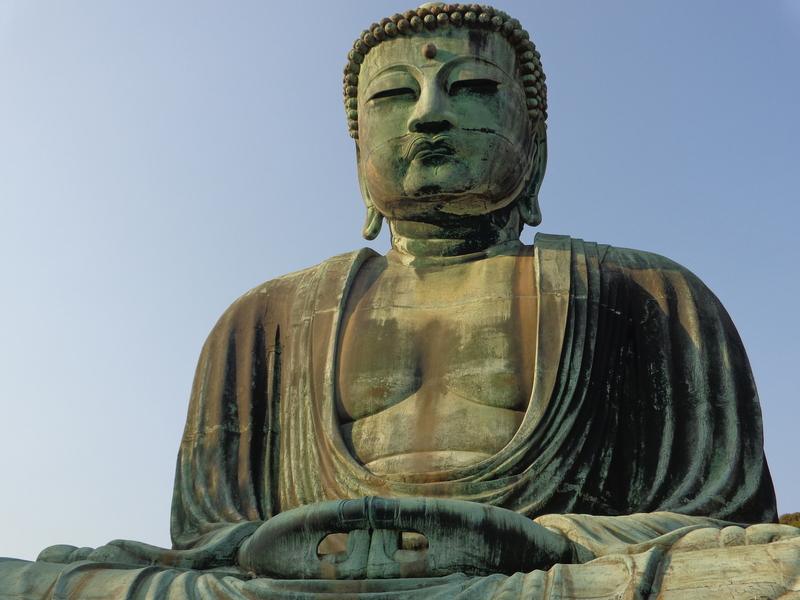 The second occasion was when she arrived at the 50-foot-tall bronze Buddha in Kamakura, Japan. The giant statue had been built in 1250, more than 700 years ago. “Nellie climbed up a ladder inside the Great Buddha and looked out his eyes,” Ms. Brown said. The ladder is gone, but tourists still are allowed to walk down narrow steps into the statue’s belly. Ms. Brown was following Ms. Bly’s footsteps when she stepped inside the Buddha. Why re-create Nellie Bly’s journey? Ms. Brown began her newspaper career at the Lakeland Ledger and the Tampa Tribune in Florida before moving to Great Britain in the 1980s. Ms. Bly became a 19th-century celebrity, but she was someone who had real accomplishments, Ms. Brown said. At the start of her career in Pittsburgh, she wrote stories about abysmal conditions for working women in local factories. She made a name for herself in New York City with a first-person series about the terrible care given patients in mental institutions. More than a century later, Ms. Bly’s horrific experiences at a New York insane asylum became the subject of a “4-D” documentary movie at the Newseum in Washington, D.C.
That museum features multimedia displays devoted to the history of journalism and press freedom. One item there provided Ms. Brown with another direct link to Ms. Bly’s journey. The small leather satchel the pioneering journalist carried around the world is on display at the Newseum. “She is a much better celebrity role model for young women than Paris [Hilton], Lindsay [Lohan] or Kim [Kardashian],” Ms. Brown said. Travel, whether in the 19th or the 21st centuries, comes with weather-related challenges. Ms. Brown faced her biggest one courtesy of a typhoon that struck Hong Kong as she was making arrangements to travel into China. A “Level 8” storm warning meant Hong Kong was shutting down in the face of heavy rains and winds that could reach 100 mph. Ms. Brown, like Ms. Bly, traveled by herself. Both women occasionally met up with friends while on their journeys. Ms. Brown’s husband, David Stanton, met her during a stop in Washington, D.C., a city Ms. Bly did not visit on her trip around the world. Their daughter, Acadia, 19, is a sociology major at Britain’s University of Winchester. She initially was not pleased with her mother’s plan to follow Ms. Bly’s route, but Ms. Brown said her daughter now takes pride in her accomplishment. Ms. Brown’s dispatches from the road can be read at nelliebly125.wordpress.com. While crossing the United States, Ms. Brown also made a side trip to Armstrong County, visiting Apollo and Burrell , places where Ms. Bly grew up. 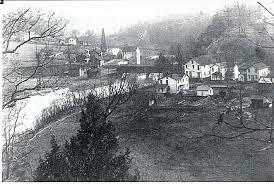 Cochran Mills, where Nellie Bly was born, has disappeared. Nellie Bly was a pen name for Elizabeth Cochran. She was born May 5, 1864, in the village of Cochran Mills in Burrell. The town is gone, but the community’s most famous native has been honored with a bronze plaque. It is attached to a millstone like the ones used at her father’s gristmill. Ms. Brown turned 60 last year, and that milestone event was one reason she decided to follow Ms. Bly’s journey while she had time, health and opportunity. “It was a big birthday, and I realized that if there is something you want to do, you better get on with it,” she said. In 1894, at age 30, Ms. Bly left journalism after she married an elderly manufacturer named Robert Seaman. She took over his business after his death. She later returned to journalism and was working for the New York Journal when she died of pneumonia in 1922. She was 57.